Officially, her given names were "Elizabeth Barrett", and her family name "Moulton Barrett", but the Moulton part was rarely used. 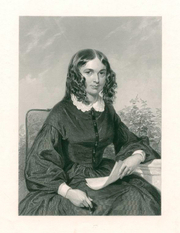 Before her marriage (Sept. 1846) she published as "Elizabeth Barrett Barrett; subsequently as "Elizabeth Barrett Browning". The love story of Elizabeth Barrett, one of the most prominent poets of the Victorian era from a young age, and the poet and playwright Robert Browning, has itself inspired many works of fiction and biography. Their courtship had to be conducted in secret as her domineering father did not want his children to marry. After much planning, in 1846 the couple married in a private ceremony in London and then eloped to Paris. They went on to Italy, which became their home almost continuously until Elizabeth's death. In 1849, at the age of 43, between four miscarriages, she gave birth to a son, Robert Wiedemann Barrett Browning, whom they called Pen. Elizabeth Barrett Browning is currently considered a "single author." If one or more works are by a distinct, homonymous authors, go ahead and split the author. Elizabeth Barrett Browning is composed of 25 names. You can examine and separate out names.